We run into many questions where the owner realizes the front tires are not engaging when in a 4WD mode. The first and easiest step is to check for the appropriate sounds from your system. With the engine off, but the key in the accessory position, switch the 4WD switch from 2HI to 4HI. You should hear two distinct electric motors activate. The first is a high-pitched whine that lasts approximately 2 seconds. This sound should emanate from the front passenger wheel-well, it is the front axle actuator. The second sound is a lower-pitched motor that operates quickly (maybe 1/3 second). This sound comes from the encoder motor on the side of the transfer case, under the center of the vehicle. If you do not hear one of the sounds, that should be a clue of where the issue is coming from. Usually an inactive motor will be coupled with a “service 4WD light”. If you believe your front tires are not receiving power when in 4HI or 4LO, and the “service 4WD light” is not illuminated, follow the flowchart to the right. Please ensure to park on level ground, place the vehicle in park, and properly chock your tires before performing the diagnostic check. Even if the flowchart points to a particular system as the culprit, there could be other variables interfering with the diagnosis. The flowchart only gives you a best initial guess. 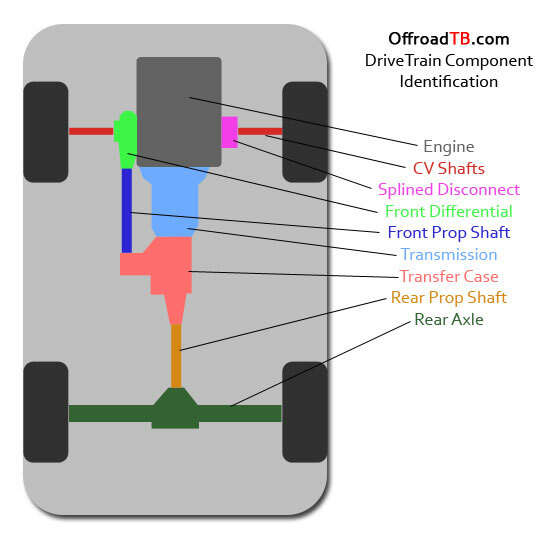 For instance, one individual reported no 4WD and the flowchart pointed towards the disconnect, however the actual issue was that the CV shaft had popped out of engagement with the front differential. Luckily he found this after a cursory check of all driveline components.